UChicago Medicine’s team includes some of the nation’s best minds in cardiology, cardiac surgery, vascular surgery. We offer treatments not available at other hospitals, providing hope for patients the most complex conditions. Our team includes expert specialists and researchers focused on diagnosing, preventing and treating the following heart and vascular conditions. We are here to help patients and family members who will be visiting us. We’re proud to be among the nation’s most elite programs for heart and vascular surgery and diagnostics. Our heart and vascular specialists can offer expert second opinions and alternate treatment options. Explore how we’re shaping the future of cardiovascular care for adults and children. Our cardiologists, cardiac surgeons, vascular surgeons and researchers are delivering the most advanced, most personalized treatments to more of the patients who need them most. 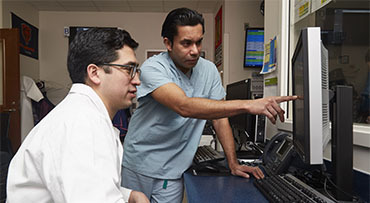 UChicago Medicine is a world leader in patient care, and our nationally recognized heart and vascular physicians make unparalleled patient care their priority goal. Today, that commitment to innovation affects everything we do. Our constant improvement in care allows us to offer patients the most advanced treatment options available. We’re a leading center for advanced robotic and minimally invasive cardiac and vascular surgeries. These innovations help us repair coronary artery disease, heart valve conditions, aortic aneurysms and more — with fewer risks and faster recovery time. Our team of cardiovascular specialists has access to the most innovative diagnostic tools and treatments. With the latest advances in diagnostics and treatments, we are able to identify and repair all types of heart and vascular conditions to improve outcomes and ensure the best quality of life for all our patients. We’re pioneering and perfecting the most precise heart and vascular procedures. At UChicago Medicine, we perform more clinical trials than any other hospital in Illinois. These groundbreaking research studies are helping doctors around the world find new ways to treat and cure all types of heart and vascular conditions. And they also give our patients earlier access to breakthrough medications that can have life-changing results. At UChicago Medicine, we’ve been advancing the boundaries of medicine for almost a century. Our leading-edge research and groundbreaking discoveries opened the door to a healthier world. Today, that commitment to innovation affects everything we do. And it’s why we bring the same level of exceptional care to every patient we treat. 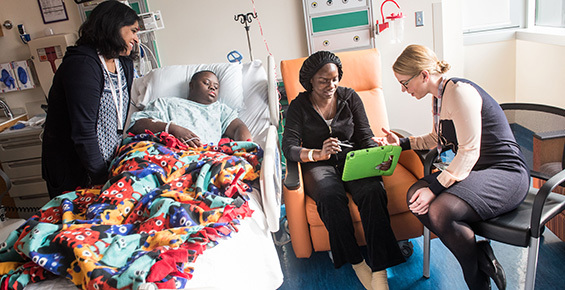 The pediatric cardiology team at the University of Chicago Medicine Comer Children's Hospital brings patients the latest in heart research and treatments while delivering personalized, compassionate care to each family. We offer comprehensive services from diagnosis of prenatal conditions to treatment for adults with congenital heart disease. Comer Children's Hospital has some of the world's best pediatric cardiologists and cardiac surgeons treating the smallest hearts. 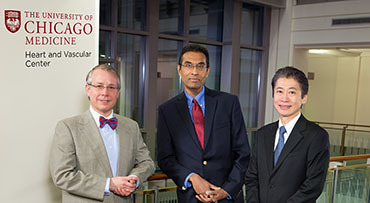 Why UChicago Medicine for Heart Care? Experts in cardiology and cardiac surgery excel in treating heart transplantation. [MUSIC PLAYING] To a build a team, a team that share values-- the values that are caring to each other, caring for the patient, and take the patient as a role, and not ourself. As such, we develop a system that work as a team and not as an individual. The Advanced Heart Failure Program at University of Chicago is about 25 years old, and it's really a very special program. And people always say, well, what distinguishes the program? And over the last couple of years, the real distinguishing features are our outcomes, which are some of the best in the country, if not the best in the country. And we really pride ourselves on that. Went in July 26 for the test, and right there in the room, Dr. Sayer — he told me that I need a new heart. So that was July 26. So they put me in the hospital right then. And then on August 10, I got put on the list. And then two days later, on August 12, one of my colleagues called the hospital and said that one of her relatives had passed away and that they wanted to donate his heart to me. We got an offer. And I said, how is it possible that we're getting an offer? We just list the guy. And I said, no, near — this is a direct offer. This is going only Brian. This is a heart for him. And I said, wow. How can it be? It was a heart that one of the teacher from Brian high school — one of her family member passed away, and she knew that Brian is waiting for the heart transplant, and the family agreed to donate the heart for him. And it was a perfect fit. The donor family — just how grateful I am. Not only for me, but for my family. Obviously I wanted to stick around and see my kids and be productive and effective in life, but my kids get to see me too. Patients who absolutely will not take blood, even if it means death. And many programs will not transplant or put LVADs in that patient population, because they don't want that mortality reflecting in their statistics. We've taken on probably a more spiritual, kind of universal approach and said that if these patients need to have therapy, then maybe we're the ones who can give them that therapy. I'm from Nashville, Tennessee, and I was a very healthy 47-year-old that was very active. I was active in my ministry. I enjoyed outdoor activity. In fact, before this all happened, I was getting ready to go snow skiing. The University of Chicago was actually on a list that we have that would accept ones like Lisa to do bloodless surgery. He was just so — I mean, really comforting. He was willing to do what I needed and respect my faith. So yes, transplant is about something that is spiritual sometimes — feeling that I will never understand. It's written somewhere else. And even though I fought and I believe other in the team that she doesn't have the time. She knew, inside of her, by the way — Lisa knew that she will be OK.
You just get stronger and stronger, and then I look back, and wow — it's like really, really came a long way. They treated us like family. And then when we were having the bad days, they come and give you a hug. They said 50% of the family could get it, and two of the four got it. I didn't get my dad's blue eyes, but I got his heart failure. One is Ron. One is Robert. One is young. One is older. The younger get the transplant before the older, so he actually became the older of the younger. So this is a really wonderful, wonderful story. I was shocked, too, because I came with him. I knew he wasn't feeling good, but I didn't think he was that bad. We see him in the hospital, I mean, he's got the balloon pump going, and I'm like, holy crap, Ron. I'm sorry, you know? — compared to my heartbeat. — and it's just moving you. It was just — it's surreal. You actually feel like you did before the disease was starting to get bad. But in the end of the day, it's about continuing life and to continue to be alive. So for me, Lisa Whitley, the [INAUDIBLE], Brian Clark, Sarah in the room, and all the people that sit here is about continuing life. That spirit that the program brings, that allows me to be able to expand what I can do and help patients — is what keeps me going. Wakes me up in the morning. 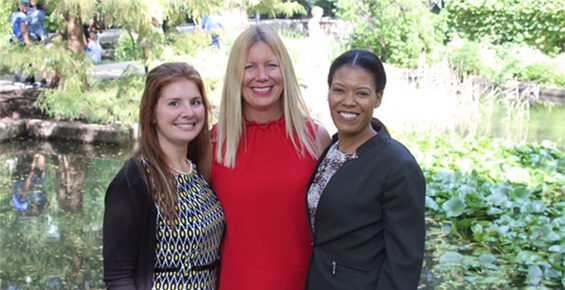 Destination UChicago Medicine is a new program providing concierge services for patients traveling from beyond our service areas. Call 773-702-0525 for more information. Our guide is designed to give you helpful resources and information to make each patient's and visitor's stay as comfortable as possible.